Electrically operated projection screens have the advantage that they can unroll automatically, using an electric motor. Our electric projection screens are available with a variety of fabric types. Different (standard) sizes are available, depending on the type of screen; the smallest screens starting at 160 cm, the largest up to even 12 metres. 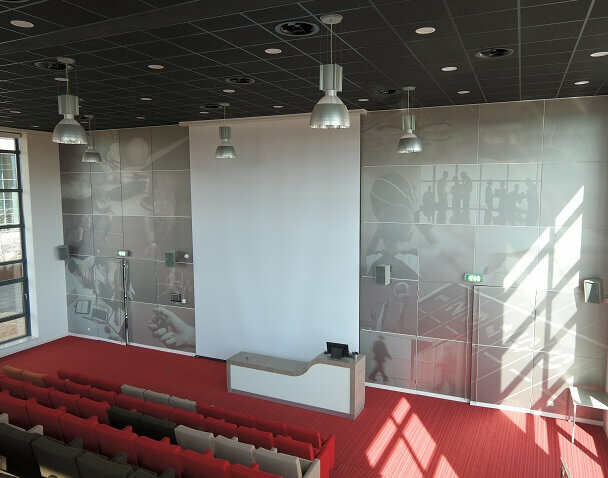 Electric projection screens are highly suitable for applications in home cinema, schools, companies and public spaces. Since 2015, we have had our own line of high-quality standard products for projection systems: Macada Basic. The electric projection screens are part of these. More information about our electric projection screens can be found on pages 2 - 39 of the Macada Basic Product Catalogue. The most suitable temperature for the Macada Basic PVC-screen is 18-25°C; the screen cannot withstand large differences in temperature. That is why we advise you NOT to put Macada Basic screens near heating elements or air conditioners, or in front of a window.